The essential movement online training provides you with 35 tutorial videos offering an extensive education into BeMoved Founder, Sherry Zunker’s movement style & technique. The tutorials provide you with a rich understanding of how to execute each movement. The videos introduce you to all the possibilities that the style of movement can have. The tutorials show you that you’re not merely exercising; you are also moving your body in a way that is expressing yourself through the choreography. We believe these videos are filled with information and inspiration to take your BeMoved pedagogy skills to new heights. Our intention is that these tutorials will inspire you to take the next step and become a BeMoved certified instructor. The tutorials provide you with a rich understanding of how to execute each movement. The videos introduce you to all the possibilities that the style of movement can have. The tutorials show you that you’re not merely exercising, you're moving your body in a way that is expressing yourself through the choreography. The essential movement training is a prerequisite to becoming a BeMoved Certified Instructor. By making this purchase you are not obligated to become a BeMoved Certified instructor. 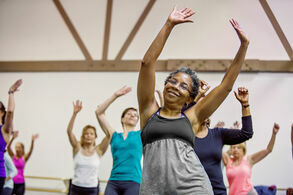 The Essential Movements of BeMoved program is not a certification course. Only BeMoved Certified instructors can teach BeMoved Dance classes. In order to teach BeMoved Dance classes you must complete the Essential Movement of BeMoved prerequisite program, and following this you can register for The Methodology of BeMoved Level-1 Certification course. Terms and Conditions for all BeMoved training programs and course are outlined HERE. Once you complete the Essential Movements of BeMoved online course, you are eligible to attend a Methodology workshop. BeMoved Methodology is a comprehensive two-day workshop that focuses on BeMoved’s core principles, teaching methodology, and class structure. Methodology Workshop attendees are guided through the certification course by Founder Sherry Zunker herself, as well as experienced mentors, who provide immediate help and feedback, supporting the attendees as they learn the foundations of teaching the BeMoved dance style. Along with mentorship, a portion of the workshop is dedicated to the Business of BeMoved.